HomeI CAN too throw a party! I CAN too throw a party! Now that I’ve written about “limiting beliefs” they began to tumble around me like playful children. I was thinking about the “little do” that I threw last week when I had my book club in for dinner and discussion. I took the day off to prepare… I was so panicked I felt like I should have taken the whole week off! to get ready. I was so flustered I finally had to stop and ponder what was going on. 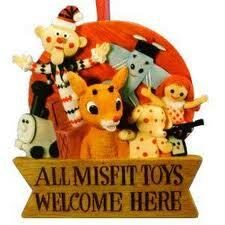 After all, what makes a misfit??? neighborhood. Then the voice started in on the food. “You haven’t created a theme. You’re not a very good cook. You don’t even know if people have food allergies!” You probably understand the “critical voice” drill. The hard I try, the louder it gets. It sure can get old. Just for the record, the party went fine. The food was delightful, the conversation and friendship was fabulous. Mission accomplished. The limiting beliefs were wrong. HA! Even with that, I was giving the ole LB’s too much space. Then it hit me. My limiting beliefs aren’t just about me. When I am consumed and designed by limiting beliefs, they have as big an impact on those around me as on me. Here’s where I’m going with this. Remember that I spent the hours prior to my party focused on how people were going to judge me and how hard it would be to live up to the expectations (that I was making up)! How welcoming is that? More than questioning my ability to be a hostess, I was coloring the character of my guests. From the smallness of my limiting beliefs I was seeing my friends as judgmental shrews who were simply coming to see what I had done wrong. If that were true, you’d have to question my taste in friends! And its NOT true, they are incredible women. Oh, the power of limiting beliefs! When I look at life through the lens of limiting beliefs I play small and I see a world of scarcity. So what’s to be done about it? This is simple – be ready for it. What’s to be done? Just notice. Notice when the energy inside you is tense, hard and unpleasant. That’s the time to stop and look inside: How am I seeing the world? What am I making up? What is showing up as a belief – a truth – that is powerful but limiting? Here’s the caution. Limiting beliefs will try to convince you that they are true–that I’m a lousy cook,or that my house is dumpy – that I’m not good enough and no matter how hard I try I’ll probably fail. The real truth here? Limiting beliefs are the critical voices in our heads that we can say “no” to. I mentioned noticing the energy. Here is how it works. if you notice tension or churning – that negative energy that makes what you are doing “un-fun” that’s it. – you’ve pinpointed it. Here’s the good news – Just noticing begins to take its power away. Follow that noticing by a deep breath or 2 and relax. Breathe the tension away so you can remember what is good – what had you busy in the first place. In the case of my party it was my friends. They weren’t coming to critique my cooking or my house. They were coming to be together, to share a meal and engage in meaningful conversation. What are the implications in leadership? Limiting beliefs would have us play small. They would have us make assumptions and judge others. Not good as a leader. Our job is to notice, breathe and turn our attention to what is important and quit follow the energy of the critic! ← And so I repaired the sprinkler system myself!